As of January 2019, Sweden will open its doors to the masses of international gambling operators who are looking to set up business in Sweden. This is an unprecedented move by the Swedish government, who had previously cornered all gambling activity in Sweden. The floodgates are set to open in Sweden as online sports betting looks poised to grow dramatically in the years to come. As expected, it did not take long for international operators to raise their hand and submit license applications. This is hugely positive news for Swedes who will now have incredible access to international bookmakers who provide odds and markets for sports all over the world. As far back as 1934, the Swedish government aimed to gain a handle on gambling. In order to abolish illegal gambling, a tightly regulated private bookmaker Tipstjänst, was established. With a solitary firm in operation, betting activities could be more closely monitored and controlled. In 1943, the state purchased Tipstjänst and nationalised the bookmaker. This model existed for over fifty years, until in 1997, Tipstjänst merged with a smaller state lottery and adopted the name Svenska Spel. The Svenska Spel provided betting on sporting events, lotteries and also controlled the operation of gaming machines. Changes to the law in 2002 allowed Svenska Spel to expand their offerings, with online bingo and scratch card style games legalised. In 2005, online poker was introduced, but still under the watchful eye of the Swedish government. In 2005, Ladbrokes tried to set up betting operations in Sweden but their attempts were swiftly rejected by the Swedish Supreme Administrative Court. In 2006, an official inquiry found that under Swedish law, there was no way of stopping foreign online betting firms from offering their services to Swedish citizens. With the country unable to impose any penalties on foreign operators for accepting Swedish players, there has been no reason for the major European bookmakers not to offer their services. Virtually every online bookmaker worth their salt have opened their business to Swedish customers and bookmakers such as William Hill, Ladbrokes, Coral and Betfair all provide their websites in Swedish, making it easier for players to understand the different markets. Betsafe are a Swedish owned bookmaker who operate out of Malta. They are very popular in Scandinavia and cater to the needs of their clients, enabling them to deposit in their home currency of the Swedish Krona. Unibet is another firm with a strong connection to Sweden (founded there before relocating to the UK) and their website is focused strongly towards the Nordic market. Another Swedish firm operating on from a foreign base are Betsson. They were founded in 2001, and were one of the pioneers of live betting. These three firms all escaped the monopolistic Swedish market, but have maintained their focus on the citizens of their home nation, providing odds on the popular sports and gaining popularity in the process. For those wishing to bet with a licenced bookmaker in Sweden, there are essentially two main options. AB Trav och Galopp is one strand of the state owned bookmakers who manage betting on the horse racing industry and they produce and run the Totalisator. Svenska Spel is the other, and they deal with all other aspects of gambling such as lotteries, casino and other sports betting etc. There are a handful of smaller companied who are licenced, but individually they only make up a small percentage of the market. The Swedish law states that players who profit from poker, can be taxed at 30% on their winnings, if they were obtained from a company operating outside of the EU. Winnings generated from bookmakers who are licenced within the EU, are not taxable. Sports betting winnings are not currently taxed. The payment options are fairly standard for Swedish customers. With no official restrictions or illegality of using foreign sites, accounts with major bookmakers can be funded through a plethora of different methods. For instance, Pinnacle Sports give customers the option to deposit in Swedish Krona via bank transfer, Visa or Mastercard, Entropay, Skrill or Neteller. The bank transfer can take up to 5 days, but the rest of the deposit methods fund the account instantly. Other sites such as UK bookmaker Ladbrokes offer additional avenues of funding, such as Paypal and Ukash. Whilst all sites offer deposits in Euros, an increasing number are facilitating the Swedish Krona. Invented by local neighbour’s Denmark, it is no surprise that handball is an extremely popular sport in Sweden, with the national team joint record holders for the number of victories at the world championship (four). Football is obviously popular and although the domestic league is not particularly strong, the Swedes can boast one international superstar in Zlatan Ibrahimovic. With a large percentage of the population speaking English, the English Premier League is keenly followed, with betting turnover high. Golf is a favourite pass time of the Swedes with current world number 3 Henrik Stenson flying the flag, and there are a total of 32 Swedes in the top 1000 players. Naturally with a cooler climate, it is no surprise to see winter sports popular, and the Swedish Hockey League (SHL) has big support. Based on average players’ salaries, the league was ranked as the fourth highest playing league in the world in 2006, and attendances have consistently been some of the biggest in Europe. The Swedish authorities have promised to look into deregulating their current gambling market in 2014, but they have reneged before, and it would be no surprise to see them do so again. 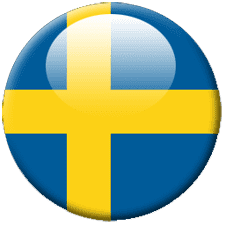 Although there are very few licenced bookmakers within Sweden and active marketing by foreign firms is illegal, it does not significantly affect players as foreign operators are so accommodating – providing sign up bonuses, Swedish translations and the option to deposit in the Swedish Krona. Deregulation could see the Swedish government increase their revenue through licence fees and taxes, but until then it will be no surprise to see increased action from Swedish citizens with the bigger and better European bookmakers.